UNITED NATIONS, September 7 -- The killings in Darfur were described to the UN Security Council late on Tuesday, by UN Peacekeeping deputy Atul Khare. Afterwards Inner City Press asked first US Ambassador Susan Rice, then Khare, about the killings, and restrictions on the UN's ability to protect civilians in Darfur. Khare repeated, even read from, the notes read out earlier on Tuesday by acting Deputy UN Spokesman Farhan Haq in response to Inner City Press' questions. The UNAMID mission, he said, was able to get to the Tabarat Market on September 4 and found it almost empty. It went back on September 7 and now estimates that 50 people were killed. But what, Inner City Press asked, about the document it obtained showing that UNAMID peacekeepers initially declined to go to Tabarat, saying they needed approval from El Fashir and, it seems, Khartoum? Khare said that would be a restriction on the movement of UNAMID, and therefore impermissible. Video here. But earlier Haq said that such approvals were “the normal procedure.” Video here, from Minute 10:21. Which is it? Susan Rice, surprisingly to some, deferred to Khare. Video here. Equally surprising, it was France and not the U.S. which requested the Darfur briefing. While some say that it is Scott Gration minimizing the upsurge in killings in Darfur, of late the US Mission to the UN is hardly leading on the issue. The rapes in Congo are terrible, but the US Mission should be able to lead on more than one issue at once, shouldn't it? 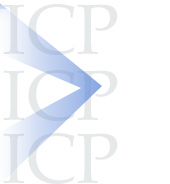 Watch this site. Khare said that in the IDP camp in West Darfur, nine people were killed, and more injured. Those who are followers of Abdul Wahid Nour did not accept transport to Zalingei, fearing for their lives -- or fearing being turned over by UNAMID to the government. They were treated in the camp. Inner City Press asked Khare to respond to JEM's request that the UN's (and African Union's) Ibrahim Gambari resign, for failure to protect civilians. Khare declined to answer. 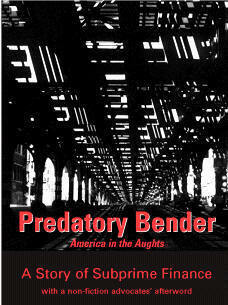 But afterward, outside on First Avenue, he promised that he and his staff will be a font of answers. We look forward to it. 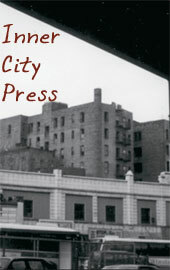 Inner City Press: we understand that France called for some kind of consultation at the end on Darfur and the killings. Can you say what information was transmitted and the what the US thinks of the events in Zalingei Camp and also in Jebel Marra where the janjaweed apparently killed 50 people over the weekend? Ambassador Rice: Well, we just heard a brief summary of what information is available to the Secretariat on the violence that occurred over the last several days in Darfur. Obviously we are gravely concerned about it, we are awaiting further information and so there is still much that is unknown. 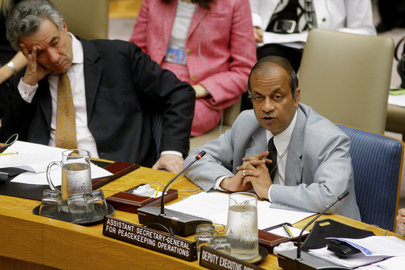 I will let Assistant Secretary General Khare, since he is here, give you any more detail. UNITED NATIONS, September 7 -- Hours after the UN confirmed that while civilians bled out in Tabarat market in Darfur, it sought permission before going there, the Security Council scheduled consultations on Sudan. At the request of France, the item will be discussed after the Congo on Thursday afternoon. France had previously asked for an investigation of the violence in Kalma Camp last month, which was blamed on followers of Paris resident Abdul Wahid Nur. This was watered down to a request to top UN Peacekeeper Alain Le Roy to come to a “full understanding of the facts” behind the violence. The UN has yet to make public any findings. Now, there are been more killings in IDP camps, Zalingei in West Darfur. The lack of accountability breeds repetition. 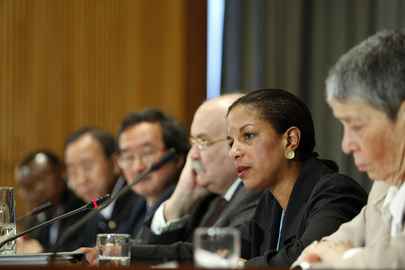 As US Ambassador Susan Rice walked into the Council, Inner City Press asked her if the US would raise Darfur. She did not answer. Now, it is France which has raised the issue -- but perhaps with a conflict of interest. Watch this site. At the Tuesday noon briefing, UN acting Deputy Spokesman Farhan Haq said that “this process of approval is a standard procedure.” Video here, from Minute 10:21. How then can UNAMID protect civilians? What does the US -- or France -- think of this UN answer? UNITED NATIONS, September 7 -- After days of death in Darfur, with the janjaweed killing at least 37 in Jebel Marra, and eight dead in IDP camp violence in West Darfur, when the UN Security Council met on Tuesday morning after its long weekend, no member had raised the subject of Sudan. As Ambassadors and political coordinators filed into the Council for a meeting on Nepal, Inner City Press asked them about the killings in Darfur. No one has raised it, two Ambassadors replied. Another spoke vaguely about expecting increased violence until the South Sudan referendum slated for January 2011. The UN Security Council created the billion dollar UNAMID peacekeeping mission, whose chief Ibrahim Gambari is now being blamed by the Justice and Equality Movement rebels for failing to respond to the killings. As Inner City Press exposed three days ago, UNAMID refused to respond to the killings in Tabra until it received approvals from Al Fashir and, it is clear, Khartoum. The Council's pronouncements about the protection of civilians are dead letters on the ground -- but in the basement of the UN, the game goes on, Nepal this morning, Liberia tomorrow. Perhaps it was in the name or service of “close working relations [with Sudan's] Government authorities” that UNAMID refused to respond to the initial reports of the janjaweed murders in Tabra -- which were not included in UNAMID's summary. Watch this site. 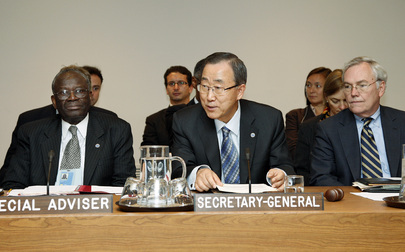 UNITED NATIONS, September 6 -- The UN was supposed to be an honest broker in Darfur. Most recently, however, UN staff member Al Tijani Al Sissi Ateem was recruited from the UN Economic Commission on Africa to head up the new Liberation and Justice Movement. 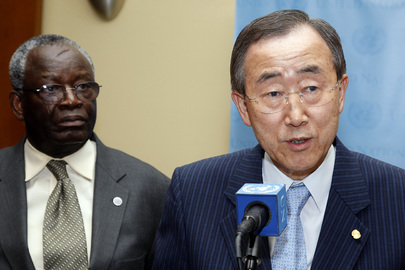 When Inner City Press asked the UN, and Joint UN-African Union Special Representative Ibrahim Gambari about the propriety of a UN paid staff member heading a “rebel” movement to negotiate with Khartoum, both have said that only joint AU-UN mediate Bassole can answer. But he won't. And apparently Bassole has no spokesperson. Cycmanick has, however, granted an “exclusive” interview to the UN's own radio station, Mireya. This is reminiscent of Secretary General Ban Ki-moon giving a "stakeout" -- fake out -- to UN Radio, rather than independent UN correspondents who would have asked questions. Ban has yet to speak on the killings in Darfur. So the UN in Darfur refuses to answer questions from independent media which cover the UN, but gives canned interviews to the UN's own friendly media. 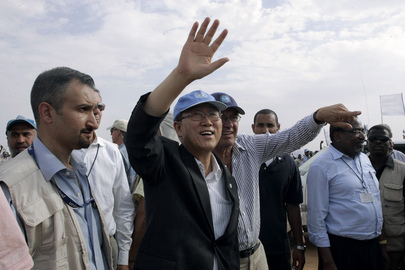 Who is more responsible: the UN or the regimes in Khartoum, even Pyongyang? Watch this site. As Darfuris Lay Dying, UN Leak Shows Failure to Respond, Stonewalling, UNSC Soon? UNITED NATIONS, September 4 -- Proof of UN inaction on slaughter in Darfur, received today by Inner City Press, is matched by silence from the UN, in Sudan and at the level of UN Spokesperson. Amid reports of dozens killed by janjaweed in the North Darfur village of Tabra, Inner City Press on the morning of September 4 sent questions to the spokesman for the joint UN - African Union Mission in Darfur (UNAMID), Chris Cycmanick, as well as to the spokesman for UN Secretary General Ban Ki-moon, Martin Nesirky, and the spokeswoman for UNAMID chief Ibrahim Gambari. Well, one reason the UN could claim a lack of knowledge of killing of dozens of people in the Tabarat Market in Tabra was that the UN peacekeepers told family members of those killed and wounded -- some of whom later died -- that they could not go to the site of the attack, until approval from El Fasher and ultimately from the Sudanese authorities. “At about 1800hrs on 02 Sep 2010, UNAMID Police Advisors received unconfirmed information from locals in Tawilla IDP camp that unidentified armed men attacked Tabarat Market near Maral village about 28kms southwest of Tawilla, where about 30 people were killed and more than 70 others were injured. While the above only refers to need approval from Al Fashir, that could be obtained quickly. But the background here is the UN's accepting of the need to get Sudanese authorities' approval to move, even in cases of medical emergency. Not only is this inconsistent with UNAMID's protection of civilians mandate -- it also calls into question the UNAMID spokesman's statements (and refusals to answer media requests), and Ban Ki-moon's spokesman's ostensible inability to provide information about the UN's actions. What will Ban Ki-moon, and the UN Security Council, do? Watch this site.